Jolicloud Me is a new web service that allows you to integrate social networks and other cloud-based services, in one place , which is available in Beta for IOS and Android platforms, but also has an application developed in HTML5 Web access from your browser. 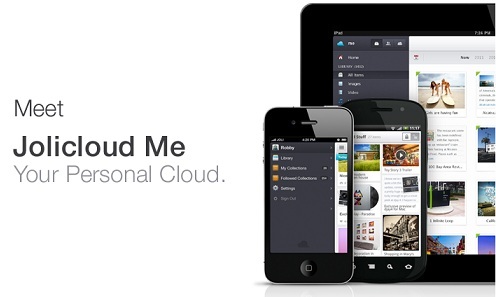 What Is Jolicloud Me ? Jolicloud Me service uses the slogan: “Your personal cloud” is in beta, which allows us to connect social networks like Twitter and Facebook with services like Picasa, Flickr and Instagram, so we can handle the information we store in the cloud, from one application through a very simple interface. When connecting multiple services, Jolicloud Me automatically create an index of all content available in each of them and organize, so that we can access this from your mobile phone without having an installed application for each. The service is open to multiple alternatives and as time progresses will integrate new services, including sound and Tumblr, Instapaper and to Spotify. For those who had not heard before about Jolicloud, it is a small startup company in France started in 2009 and two years ago introduced an Jolicloud OS based on the cloud, called Joli OS , in order to make computers less powerful in powerful tools, the own style of Chrome OS to Jolicloud download. The introduction of this new service is part of the efforts of Jolicloud to become a strong competitor in the emerging market of ” personal cloud”. In the words of Tariq Krim, CEO and founder of the Jolicloud, the idea came from listening to users complain about being “lost their lives” among multiple competing services in the cloud. According to some analysts, Jolicloud will face great challenges from now, foremost among them, make users familiar with the concept of “personal cloud” and understand what it really means. In my opinion, Jolicloud Me and idea behind that is really interesting and will surely give a lot of talk in the coming weeks. This service confirms the fact that the cloud is completely changing the way we communicate and share, offering access, virtually unlimited content from all across devices that fit in the palm of your hand. Those interested can from now request an invitation to start connecting services. Although there are no specific dates for the final release is expected to Jolicloud Me is available to all public in the coming weeks.